Original Antique Maps and Prints. 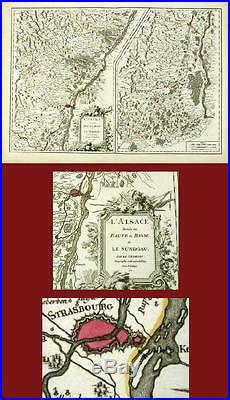 ANTIQUE MAP- ALSACE – STRASSBOURG- FRANCE-VAUGONDY-1753. This is an original antique map of the Alsace and Sundgau, France, by Robert de Vaugondy. This very decorative map was printed in 1753 and is in a fine condition. There is outline hand coloring. The overall size is 30,5 inch x 21 3/4 inch. The image size is 27 1/4 inch x 19 inch. ThePrintsCollector – Laurentius Old Master Prints Peter Cornelissen, Frans Laurentius, Joost Bos Margo van Latum-van Dongen, Frank van Latum Located in Zeeland (Noord-Brabant) – The Netherlands. GO TO OUR STORE and explore our huge collection of fine antique maps and prints. Visit our Store: we would like to invite you to review similar items in our Store or to browse through all other items in our Store. We are confident that you will find very special unique antique maps and prints in our Store. It is our privilege to have you as a customer. The item “ANTIQUE MAP- ALSACE STRASSBOURG- FRANCE-VAUGONDY-1753″ is in sale since Monday, April 9, 2012. This item is in the category “Antiques\Maps, Atlases & Globes\Europe Maps”. The seller is “theprintscollector” and is located in Zeeland. This item can be shipped worldwide.